This plan helps intermediate triathletes train with the structure and purposeful progression required in all three disciplines to race faster than ever before over the Sprint distance. 15 s/km faster 5k time, 15 s/100m faster swim, and my best sprint triathlon time - 1:07! I think there's no better way to improve than having a well-balanced plan. This training plan gave more structure to my training and introduced me to new types of workouts. And the results were fantastic! I got a 15 s/km faster 5k time, 15 s/100m faster swim, and my best sprint triathlon time - 1:07! Ten out of ten! Based on any combination of pace, power and heart rate. You get all the options and can choose what works best for you! Good plans are not easy to come by though. Certainly not easy to come up with on your own. And if they're looking for big improvements in the sport, the odds are not in favour of athletes who take a random approach to triathlon training, or try to create a training program themselves without having the adequate expertise. 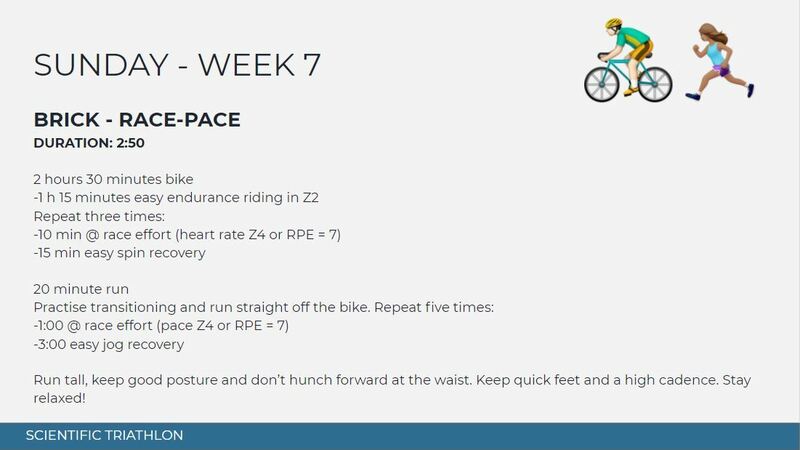 This sprint triathlon training program is for you if you are an intermediate level triathlete who wants to go faster without an excessive amount of training. You are used to training 5-6 times per week. You are a typically a "mid-pack" finisher, finishing anywhere between the top-20% and bottom-20% of the field in most races (these are very loose guidelines, of course). 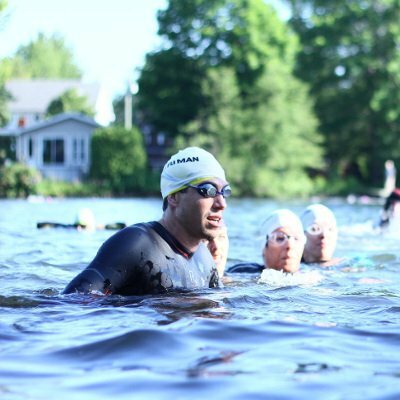 WHY IS HAVING A TRAINING PROGRAM SO CRITICAL IN TRIATHLON? The answer to this question is that, when you're first starting out, you can do pretty much anything in training and you will still improve. But as you get a bit more experience, there are several key mistakes that most triathletes make that will cause all of your progress to come to a screeching halt. Sounds sad? It is. But just because most triathletes do these mistakes, you don't have to fall into the same trap. By having a proven training plan, you can all but guarantee continued triathlon success. Not having consistency in training. 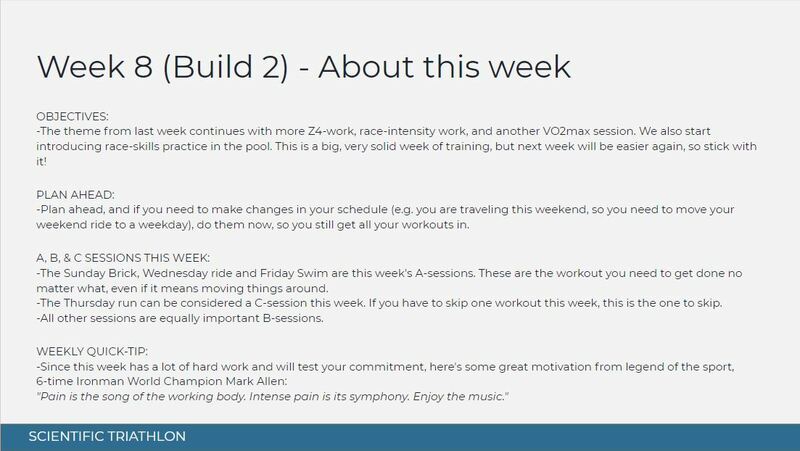 The majority of triathletes who lack consistency also lack another important thing: a training program. 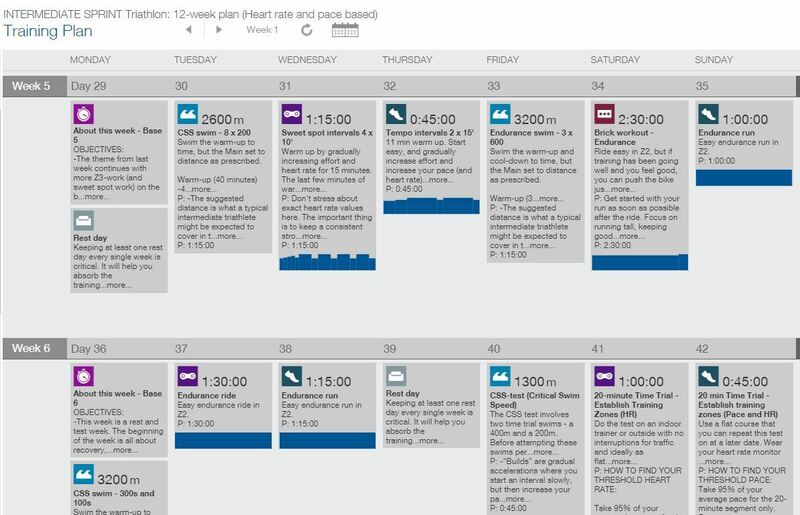 It's not rocket science to realise that having a triathlon training plan gives you a level of accountability that makes you consistent in training, which is the number one factor in triathlon improvement, whether it's about going from beginner to intermediate, intermediate to advanced, or from a kid starting out to an Olympic gold medal. Not knowing how to add intensity to your workouts. In addition to consistency, intensity also plays a major part in your triathlon development. Especially once you get past the beginner triathlete phase, and into the intermediate/advanced athlete realm. Athletes tend to get things wrong here, either doing too little intensity, too much, or getting it wrong on the workout level with an inappropriate "dose" of intensity in those quality workouts. This training schedule takes the guesswork out of intensity with a proven progression that is manageable, but challenging enough to see some serious fitness gains that just plodding along or doing random intervals here and there can't give you. This translates to ~0.35€ per day. That's a remarkable price for a proven step-by-step plan to success, and for having to fumble in the dark with your training any longer. 190-page pdf-document. But don't worry - it's not as bad as it sounds, you'll see. I just want to show you that this is one of those plans that's had a lot of time and effort invested into it, all for the purpose of having you achieve your triathlon goals. It's super easy to follow. Everything is explained at a level that anybody can understand. Unfortunately, many other triathlon training plans available require a degree in exercise physiology to understand. My training plans aren't your typical run-of-the-mill workout schedules. I have gone to great lengths to ensure not only that these plans are progressing at an appropriate rate and have enough recovery built in (both of which are elements I've found to be missing in many other plans). But I've also made sure to within the plans teach you exactly how to get the most out of them. The Intermediate Sprint plan has helped me stay consistent and avoid doing random of training - it's nice to always have a clear purpose. Plus, it saves me time from having to plan my training myself. I just needed to stick to the plan, have faith that it would improve my fitness, and it did! I would definitely recommend this plan. Everything is explained very well and Mikael is available and willing to help when required. Normally, the Training Peaks plan costs $49. 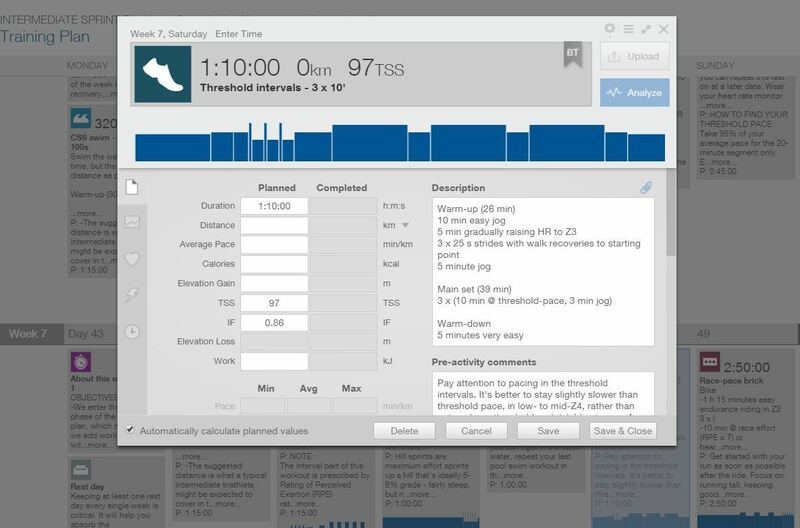 But since you are a here, you can use the coupon code "SCIENTIFICTRIATHLON031" and get a 20% discount on the Training Peaks version of the plan. Not only that, if you then email me your Training Peaks receipt, I'll send you the pdf-version of the plan at no extra cost! Don't forget to apply the coupon code "SCIENTIFICTRIATHLON031" at checkout.